Our knowledge mobilization specialists based at each partner institution are available to discuss and assist in your knowledge mobilization needs. The KM research cycle of best practices was adapted from the Canadian Water Network's "Knowledge Translation Challenges and Solutions Described by Researchers" (2012) by Elizabeth Shantz. 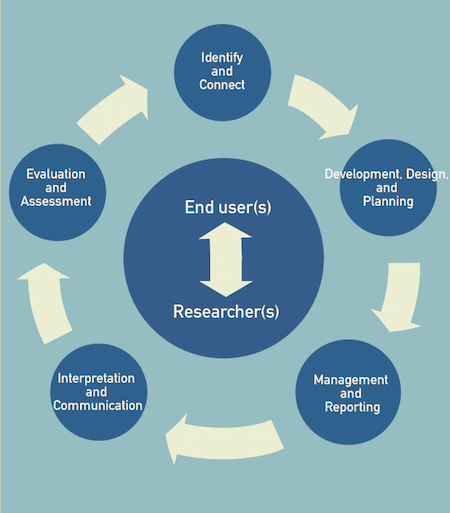 Knowledge mobilization activities are necessary throughout the research cycle, not only at the start when identifying interested end users, or at the end when delivering research products to those end users. To assist researchers in identifying key KM considerations and actions throughout the entire research process, the KM Core Team has developed step-wise flowcharts following the research cycle. We are continually developing KM process and product templates that can be shared and adapted for project use. Let us know if you would like to see something specific! Bielak, Alex, Andrew Campbell, Shealagh Pope, Karl Schaefer, and Louise Shaxson. "From Science Communication to Knowledge Brokering: the Shift from ‘Science Push’ to ‘Policy Pull’." In Communicating Science in Social Contexts: New models, new practices, edited by Donghong Cheng, Michel Claessens, Toss Gascoigne, Jenni Metcalfe, Bernard Schiele, and Shunke Shi, 201-226. Dordecht: Springer, 2008.